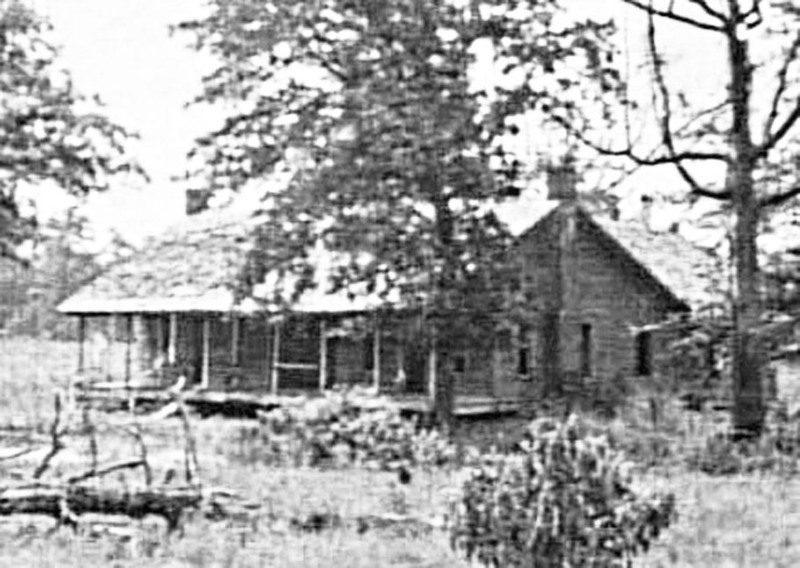 This is the Cole Farm where the Methvins were living at the time of the ambush. Barrow and Parker were also staying here, or at least were regular visitors. The house was located about two miles from the ambush site. 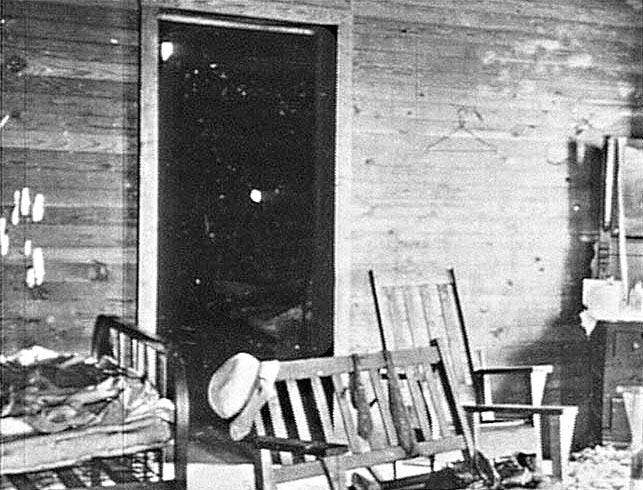 This interior shot of the Cole Farm was taken at the time of the ambush. 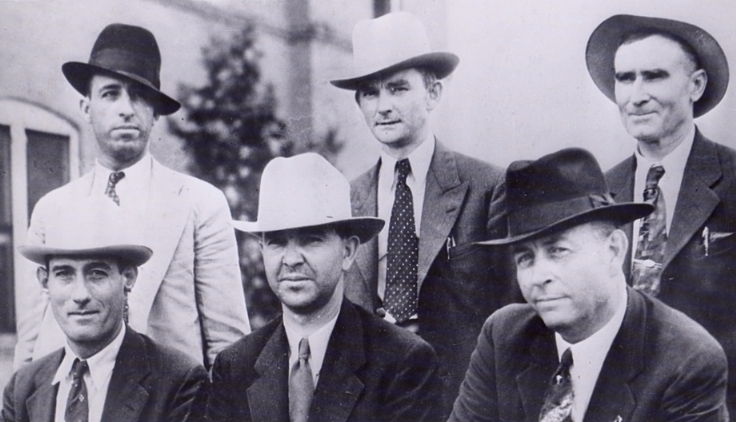 The posse consisted of, seated from left, Bob Alcorn, Henderson Jordan, Frank Hamer, and standing from left, Ted Hinton, Prentiss Oakley and B.M. "Manny" Gault. Each would tell a different version of what happen that day. Deputy A.B. 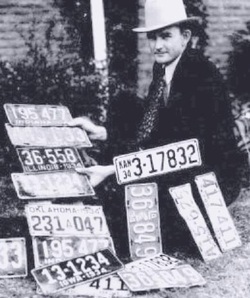 Rogers with part of the death car arsenal. After months of constant tracking, Hamer was finally ready to make his move. For some time, he had been meeting with Methvin's family, which was trying to broker a deal that would not only keep Methvin out of the electric chair, but possibly even out of prison. In exchange, they would hand over Barrow and Parker. The posse consisted of Hamer, Dallas County Sheriff Deputies Bob Alcorn and Ted Hinton (chosen because both of whom knew Barrow and Parker by sight and had actually been tracking the Barrows for many months in an operation separate from Hamer’s), former Texas Ranger B.M. "Manny" Gault, (whom Hamer, also a former Ranger, had worked with previously) and Bienville Parish Sheriff Henderson Jordan and his deputy, Prentiss Oakley (because the ambush was to take place in that Parish, it was a jurisdictional issue and, more importantly, Hamer wanted some "local boys" there who knew the area - and it was said no one knew the area better than Jordan.) It’s long believed that it was not so much a posse of six, but rather three posses of two each since each pair allegedly didn’t trust the other four. 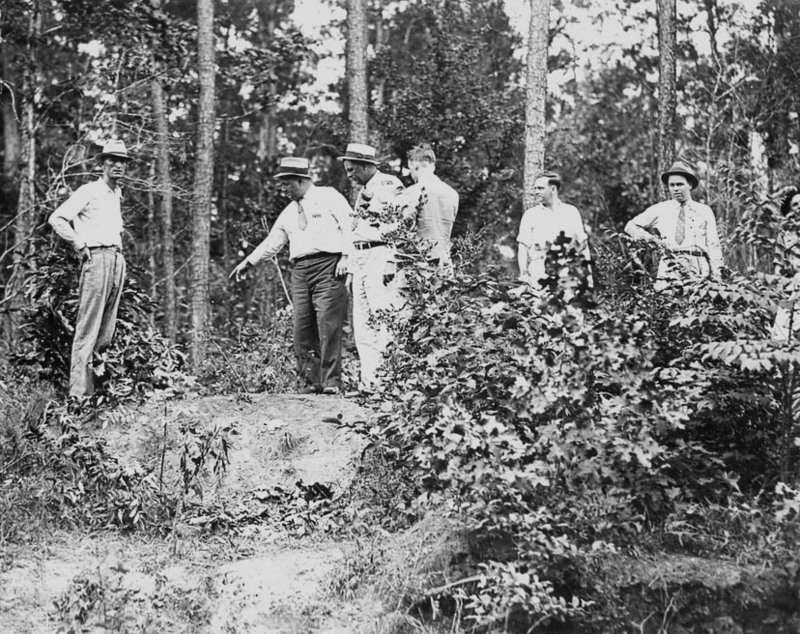 Sightseers stand at the spot where the posse was concealed that morning. The photo was taken by the Dallas Morning News the afternoon of the shooting. Oakley and Barrow's stolen plates. The six lawmen set up the ambush at a remote spot along Louisiana State Highway 154, just south of Gibsland on the road toward Sailes. It afforded the posse a clear view of the road for at least a half mile in both directions. The road crested on both sides and then traveled slightly downward toward the posse. Hinton's account has the group in place by 9 p.m. on the 21st and waiting through the whole next day (May 22) with no sign of the couple, but all other accounts has the posse setting up just before dark on the 22nd. At approximately 9 a.m. on the hot, muggy morning of Wednesday, May 23, the posse, after a long night concealed in the bushes fighting off both fatigue and hoards of mosquitoes, was almost ready to concede defeat. It seemed Barrow's uncanny luck was still with him. They decided to wait another half hour and then leave and regroup another day. At about 9:15, they heard the distinctive low rumble of a Ford V8 approaching from the north at a high rate of speed. They knew Barrow was driving a tan Ford V8, stolen from Mrs. Ruth Warren of Topeka, Kan., in April. The vehicle crested the hill and moved toward the posse. It was a tan Ford V8. The six, spaced about 8 feet apart from each other and all armed with their side arms and either high-powered rifles or shotguns, tensed. Their order from the right facing the road was Hinton, Alcorn, Oakley, Jordan, Gault and Hamer. Hinton made the positive identification of the couple in the approaching car. He turned to Alcorn on his left. "It's him. This is it. It’s Clyde." Alcorn turned to his left and repeated Hinton’s statement and it was passed down the line to Hamer. They tensed and shouldered their weapons. What is certain, however, is approaching from the south was a logging truck. Another minute or so and Barrow would be forced back into his own lane and the truck would pass between the posse and Barrow. What happened next varies slightly according to different accounts from individual posse members. One report has Hamer shouting, "Its the law, Clyde. Stop." Another has the posse simply starting to shoot. Some say Barrow reached for his gun before attempting to drive off; others say he never saw it coming. Certainly, no one expected Barrow to surrender, but Hamer likely did at least want to give him a chance to do so. However, the point is moot. 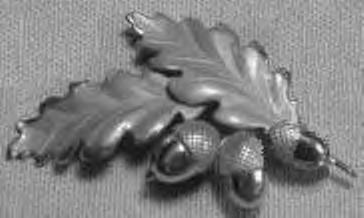 All accounts of the ambush, including his own, agree that Oakley fired first, and probably before any order was given to do so. He stood and fired as Clyde passed slowly by him. Barrow was likely killed instantly by Oakley's initial head shot (Oakley would later say as soon as he opened fire he saw Barrow's head jerk and bounce), but Parker had a moment to reflect. Hinton reported hearing her scream "like a wildcat" as she likely saw the back of Barrow's head explode. She didn't have much time to think about it, however, because once Oakley fired, they all stood and began firing. The car began to rock from the force of the bullets slamming through its metal body. Barrow had the car in low gear and, when hit, his foot slipped off the petals causing the vehicle to jerk and roll forward. It stalled, but kept rolling and this only added to the confusion as the posse likely assumed he was trying to escape. The posse continued to rapidly fire at the car moved pass them, giving each member a clear shot. Several yards down the road the car veered into a ditch and stopped with Barrow’s door against an embankment. The shooting stopped as quickly as it began, and there was complete silence. It's estimated the entire incident took a little over a minute. At least one posse member said later there was so much smoke coming from the car because of all the gunfire that initially he thought the vehicle's interior was on fire. 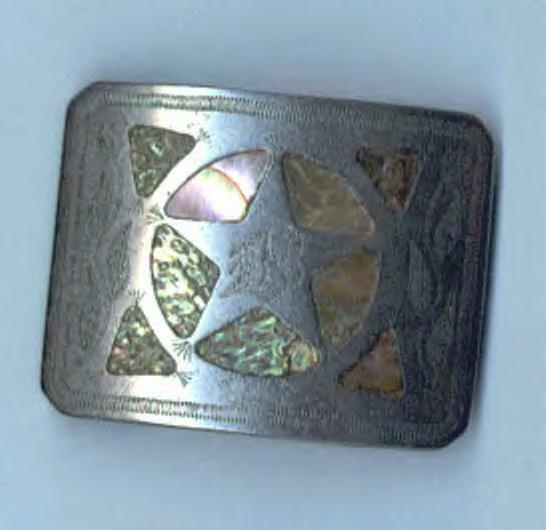 The lawmen fired approximately 140 rounds into the car, and many of the rounds passed through both fugitives. Barrow never returned fire and it's possible he never knew what hit him. "Each of us six officers had a shotgun and an automatic rifle and pistols. We opened fire with the automatic rifles. They were emptied ... then we used shotguns ... There was smoke coming from the car, and it looked like it was on fire. After shooting the shotguns, we emptied the pistols at the car, which had passed us and ran into a ditch about 50 yards on down the road. It almost turned over. We kept shooting at the car even after it stopped. We weren't taking any chances." The temporarily deafened posse (it would take several hours before all regained complete hearing)approached the vehicle, half certain it was a trap and Barrow would begin shooting or drive off. But there was no movement from the car. Hinton said he was the first to reach the car and, unable to open Barrow’s door, climbed over the hood and opened Parker’s door just as the others reached the vehicle. What they saw shocked even these hardened officers. Barrow's body is pressed against his door as tourists push forward to see the bodies of the famous outlaws. Note the small boy in the upper right-hand corner, being held by his father. The shattered windows and bullet-ridden doors are testimony to the amount of firepower the posse had. The weapons on the car's roof belong to the posse members. Clyde, 25, was sitting behind the wheel, his head back and resting against the open window. His eyes and mouth were partly open. He was in his stocking feet, as was his custom when he drove. His sunglasses were on the dashboard because the sun was to his back. Parker, 23, was bent forward, her head between her knees. In her lap was a magazine and a half eaten ham sandwich with tomato and mustard. The other half was in a brown paper bag on the back seat. Finally, there is no mention anywhere in Wade's notes from his detailed physical examination of the bodies (not an autopsy as many think) of any STDs on either Barrow or Parker. That story comes from an interview with Dr. Wade in the late 1960s when he said both showed evidence of gonorrhea. That was the first mention of it. 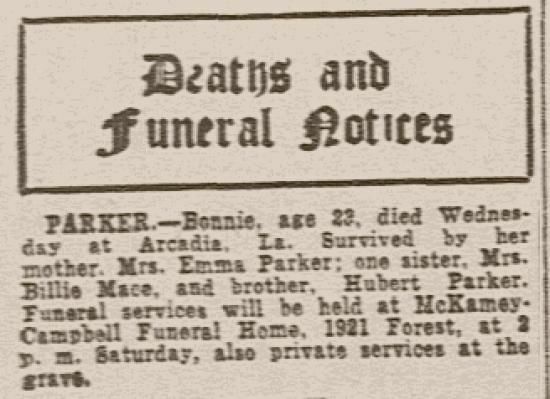 Additionally, there is no mention in the original notes nor any evidence found during the examination that Parker was pregnant, as many would come to believe. 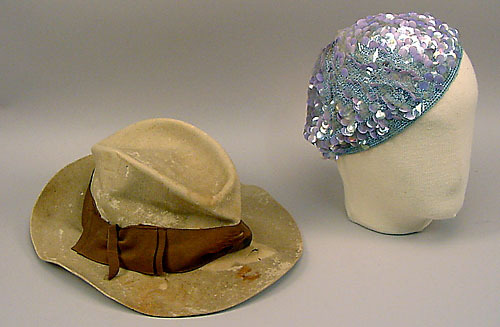 From top clockwise: Barrow and Parker's hats; her acorn broache; her blood stained sunglasses; his shirt and his belt buckle. This items were on display several years ago at the Ford museum in detroit. 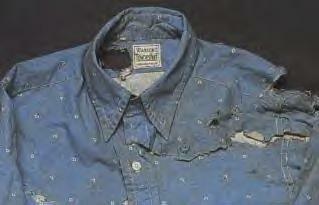 the items were from private collections. 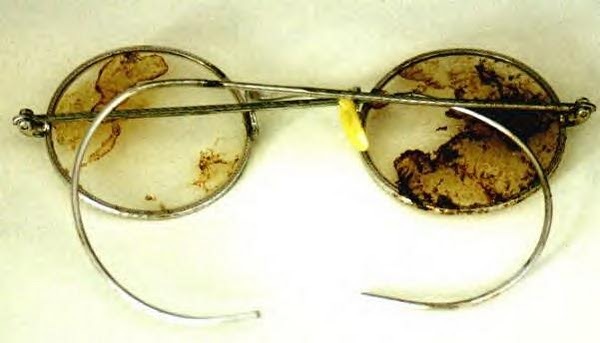 Barrow's bullet-ridden suit coat hangs on the headlight of the death car. Detail of a map that appeared in many newspapers at the time. It gives a good visual of how the event unfolded. The Cole Farm was about two miles down the road in the direction Barrow was driving. The original of this map was much bigger and gave addtional details in both directions, including the location of the Cole Farm and a filling station just down the road.